GlobeCore Unit for Transformer Oil Reclamation - ! Equipment for Transformer Oil Reclamation. GlobeCore. Disposal of sorbent is environmentally friendly and safe as Fuller’s Earth is free from oil and contaminants. The design of the CMM-R line of equipment includes automatic Fuller’s Earth reactivation for continuous reuse of the Fuller’s Earth materials. The Fuller’s Earth oil recycling system will allow oil processing to be carried out using one set of columns while the other set is re-activating the sorbent materials. Alternatively, oil processing or reactivation could be carried out in all columns giving the units a high degree of flexibility and cost effectiveness. The GlobeCore CMM-R units comprise both degassing and oil reclamation systems. The design allows for stationary as well as mobile operation when mounted on a roadworthy trailer. 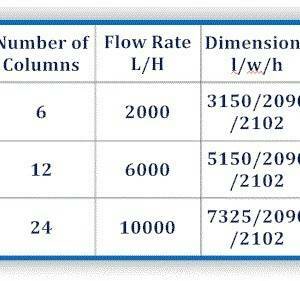 The units vary in the number of Fullers Earth columns based on the model selected and the individual needs of the customer. GlobeCore CMM-R units are available with 6, 12 or 24 columns to meet different requirements and flow rates. The CMM-R unit is fully controlled via a Supervisory Control and Data Acquisition unit (SCADA) system from a Laptop, positioned within the operators compartment and includes a touchscreen on the control panel. Valve operation is effected via a solenoid controlled compressed air system. Also included on the control system is a manual override mode. During operation, degassing and regeneration units are connected to the transformer. Oil is drawn into the degassing unit where it is heated to operational temperature and filtered. Oil is then pumped into the unit for reclamation and back to the degasser for the removal of moisture and dissolved gasses. The Figure below depicts the schematic arrangement of the CMM-R unit.